I have gone walkabouts lately: various activities and commitments have kept me away from the blog. I may continue to skip the odd day or two over the coming weeks. 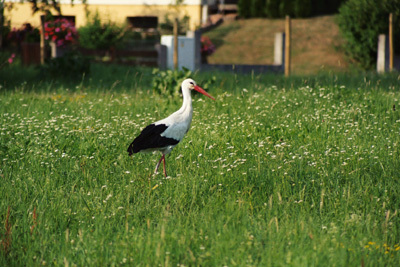 The chap in the photo above is a Cigoyne (Ciconia ciconia) a White Stork (from Alsace). These birds migrate to Africa during the European winter. I found a site at the University of Cape Town that has a map showing the distribution of these birds in Africa, as well as some useful links to sites with information about the migration of these birds: here. This is the statue of the Dying Slave (1513-1514) by the artist known as Michelangelo, which can be found in the Louvre in Paris. Michelangelo was commissioned by Pope Julius II to design his tomb. What should have been his masterpiece turned into a disaster: Julius died prematurely, and Michelangelo had to squabble with subsequent Popes over ever-diminishing funding. The tomb itself, in St Peters in Rome, is famous for its statue of Moses. 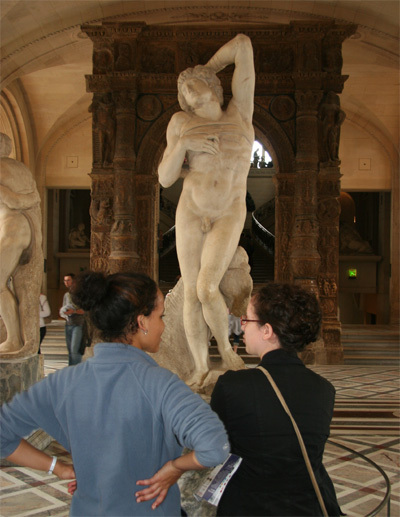 Two completed slaves, the ]Dying Slave and the Rebellious Slave, can now be found in the Louvre in Paris while four uncompleted slaves can be found in the Accademia in Florence. The uncompleted slaves are important for what they reveal about Michelangelo’s sculpturing technique: he outlined the figures on the front of the marble blocks and then worked gradually to liberate the figures from within the marble by working from this one side. The uncompleted works therefore show great detail in the front aspects, and roughness in the parts further back. Apparently the Dying Slave statue was influenced by the classical sculpture from Rhodes, Laocoon and his Sons. This photo was taken on a mobile camera phone on Saturday 23 July 2005 at about 17:30. Apparently a mini bus crashed and rolled on the M25 between junction 10 and junction 11, resulting in the closure of this section of the motorway. So I had an experience of following the diversion signs - the triangle in this case for the clockwise diversion (anti-clockwise diversions use the square). From this experience I have just one gripe: when you get to the end of the diversion the triangles keep diverting you along the alternative route - there is no explicit guideance that this is where you should rejoin the motorway. The diversion was not welcome because I was taking my sister’s family to the airport to catch a plane. 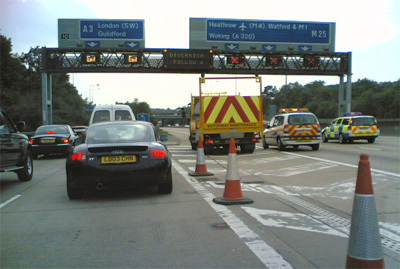 Fortunately my brother in law had a premonition of the accident and that there would be a blockage on the M25, so we left earlier than we needed to. 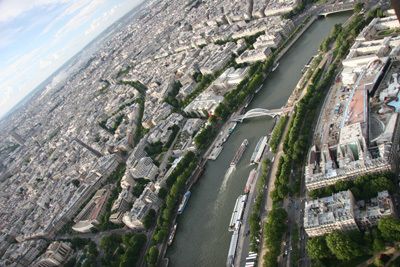 The Seine River cuts Paris in half, and the original ground zero (where the human settlement formed that ultimately became the city of Paris) is an island in the middle of the Seine called Îlle de la Cité. (It is not in the above picture). According to the wiki article above, he word Seine has Celtic origins, meaning sacred. Of course the world-famous Notre Dame de Paris Cathedral is found on the Îlle de la Cité. In the background of the photograph you may notice white smoke rising- I have no idea what caused this. The boat in the foreground of the photograph is a bateaux mouches or tourist boat. 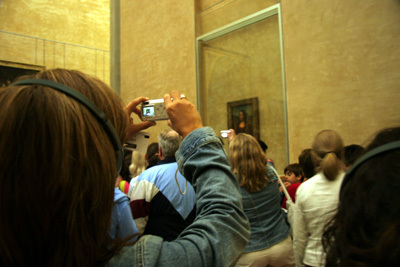 The above picture is another photo I took of people photographing other people, also in the Louvre in Paris. This morning the UKYP began its annual sitting, and I dropped off bluemeanie at the venue in Leicester. As a result I was a bit late for work, and so it was a long day making up the hours. Then of course there was the drama again in London, and the worry that the police may be starting to panic. Then again, perhaps the aurors were not police after all. Even Special Branch and SO19 (Scotland Yard’s armed unit) are not trained to do this sort of thing. My immediate reaction on hearing of the incidents is to phone everyone I know who might be in London. A colleague advised me that this is not recommended. In any case it doesn’t seem a practical thing to do on what could be a regular basis. I did a quick search on the web for any advice that has been issued to the UK public about how to behave in the the event of a terrorist attack. There is a surprising lack of such information, for example at the BBC and at the Metropolitan Police sites. If anyone knows of any sites giving advice, please let me know. The police meanwhile have said that their investigations into the bombings are proceeding at a cracking pace. One hopes that it is not too fast, given the recent contradictions. Then again it took them 26 hours to release CCTV images of the latest suspects. In theory the bombers could get to Australia within 26 hours. This is the portrait of the Mona Lisa (1479-1528), also known as La Gioconda, wife of Francesco del Giocondo; 1503-06 (150 Kb); Oil on wood, 77 x 53 cm (30 x 20 7/8 in); Musee du Louvre, Paris. This remarkable painting, of a smiling and yet aloof woman is very famous and often copied. Leonardo used what he coined the sfumato technique (soft, smoking, blending of shades), and it was Leonardo’s favourite painting. It has a certain fame, over and above the artist, engineer, inventor and philosopher who created it. As a result everyone now looks at it through the prism of movies, advertisements, songs, books, posters, postcards, reviews, and many other expressions of popular culture. 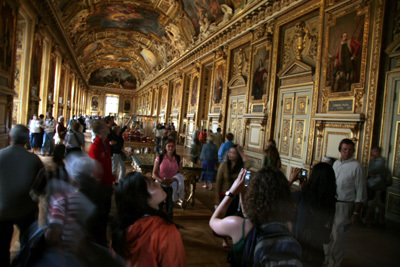 The Mona Lisa was stolen from the Louvre in 1911 (and returned 2 years later after having been discovered in Italy), and is now well guarded and protected so that visitors to the Louvre look at it through the prism of glass. Every time I have been to see it there is a crush of people in front of the glass and it is difficult to get a good look. Still we catch glimpses between head and shoulders of the persons in front of us. We take photographs, mostly of poor quality, jus so that we can show: I was there. 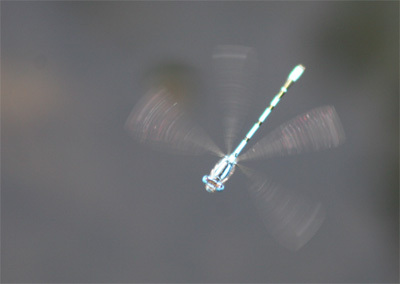 I took a photo of this dragonfly at Runnymead on the Thames last Saturday, from a moving boat. It reminds me of a helicopter.